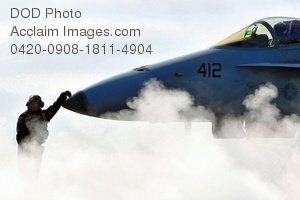 Description: Free, public domain image: Flight Crew Member Standing at the Nose of a Fighter Jet. PACIFIC OCEAN (Jan. 31, 2009) Aviation Electronics Technician 3rd Class Bashab Biswas, from Garden City N.Y. assigned to the "Blue Blasters" of Strike Fighter Squadron (VFA) 34, waits aboard the aircraft carrier USS Abraham Lincoln (CVN 72) with an F/A-18C Hornet as it is readied for a mission. Abraham Lincoln is underway on a scheduled work-up conducting sustainment training and carrier qualifications. (U.S. Navy photo by Mass Communication Specialist 2nd Class James R. Evans.